We hope everyone has a terrific 2019! * We have about 13 BSBC chapters Worldwide and answering as a whole would be a lot more general than the specific answers each chapter would provide. City, State: We are based in North Central Ohio, however, our Nomad chapter itself covers any and all areas where we have chapters and or members. When were you established? 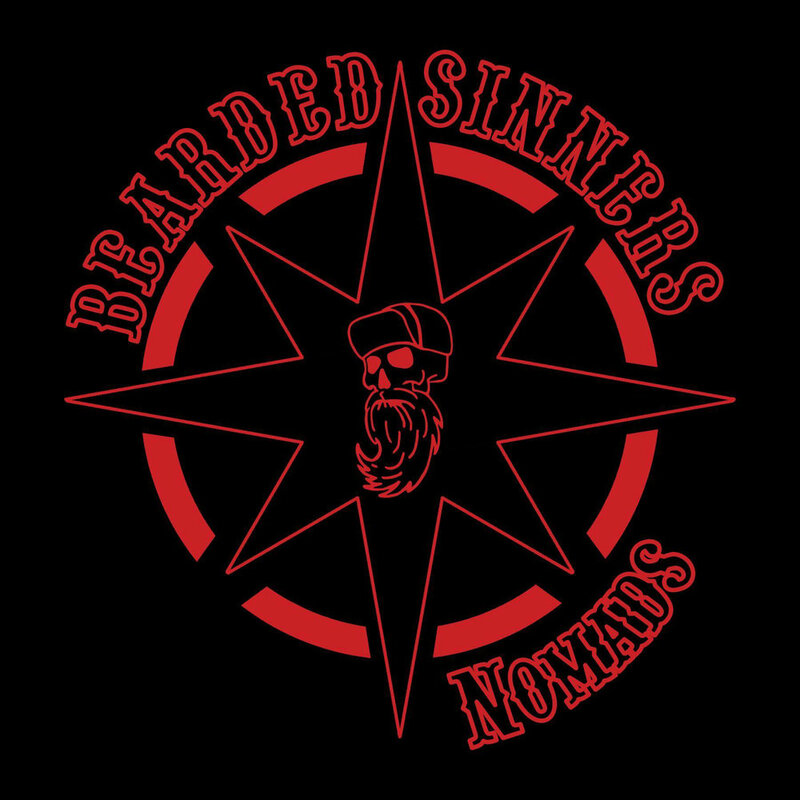 The Bearded Sinners as a whole established in 2012, our Nomad chapter itself was opened in January of 2017 despite our club having “Nomad” members since 2014. I was the original. This chapter was opened in an effort to retain members who may be displaced due to a chapter closing, or to provide them a “home” within the BSBC in the instance of relocation while they work to establish a new chapter in their new community. How many members do you have? At the moment we only have 5 Nomads and are working to reopen in Canada, which would then transition one into a regular home chapter. Our chapter roster has been as large as 8, but our primary purpose for most Bearded Sinner members is to provide a “temporary home” while allowing members an avenue to continue giving back on a bigger scale. Do you hold an annual competition? Our Nomad chapter does not hold its own annual Beard competition, however being a BSBC Nomad means plenty of travel. Part of our obligation is to support as many of our Bearded Sinner counterparts as we are able, in addition to any other clubs in our area. Do you have a charity/charities to benefit? We are happy to support any and all charitable endeavors we’re able, however we have taken to helping sponsor Bearded Hero annually in addition to any efforts our Bearded Sinner family present to us. Our primary focus as always is a “grassroots” type effort, we give back however and wherever we are able especially in regards to manpower, volunteerism and our time. Proudest moment as a club: Our chapter’s most proud moment individually would probably be our road trip to Philly in an effort to meet fellow Sinners and visit a young man with cancer in the children’s hospital a few years back, followed closely by the first Nomad member leaving our chapter to officially open one of his own as THAT is the Nomad chapter’s primary intent. Club/Product Affiliation: I'm currently the President of the Modesto Beard and Mustache Coalition and also I'm Road Captain for Beard Mobb West Coast. And Sponsored by 1740 Beard Balm. How long have you been bearding? I have been in the wonderful world of bearding for 4 years now. Have you won any awards? 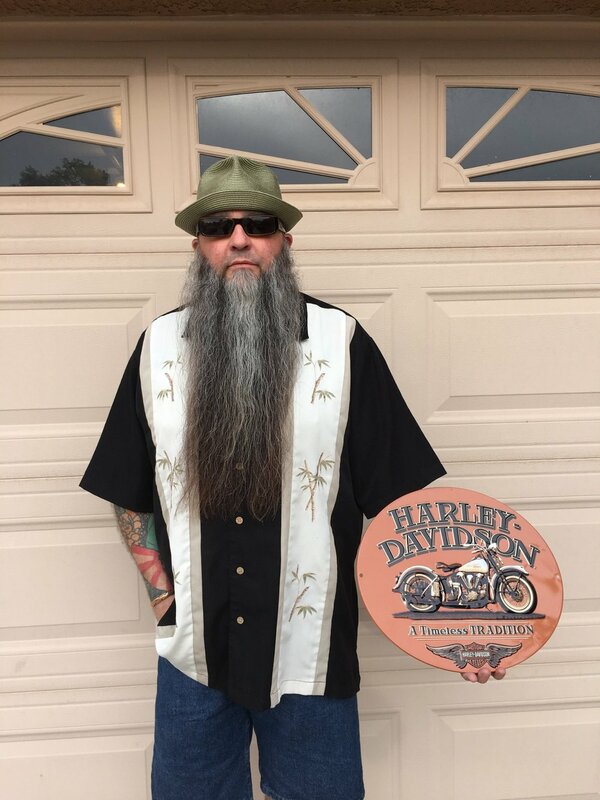 I have won several but my favorite was getting 1st at Great American Beard and Moustache Championship in 2016 for my creative beard. Why do you do it and/or Best thing about it? It's amazing that we raise money for such great charities all over the world. But what has kept me loving bearding is the amazing people who have become like my family. It's the amazing people in this community that make bearding so great and a wonderful family to be a part of. Occupation: This is a difficult question. What I usually tell people is that I’m on an early retirement. But that’s a bit misleading because I really just quit my job as an instrumentation and controls technician at a nuclear power plant when they decided my beard had become too much. Philosopher, yeah that’s gotta be on one of those beard length shirts, I’m a philosopher. Club/Product Affiliation: None. Unless we are including the hundreds of wonderful people I’ve met along the way and the dozens I now consider family. How long have you been bearding? 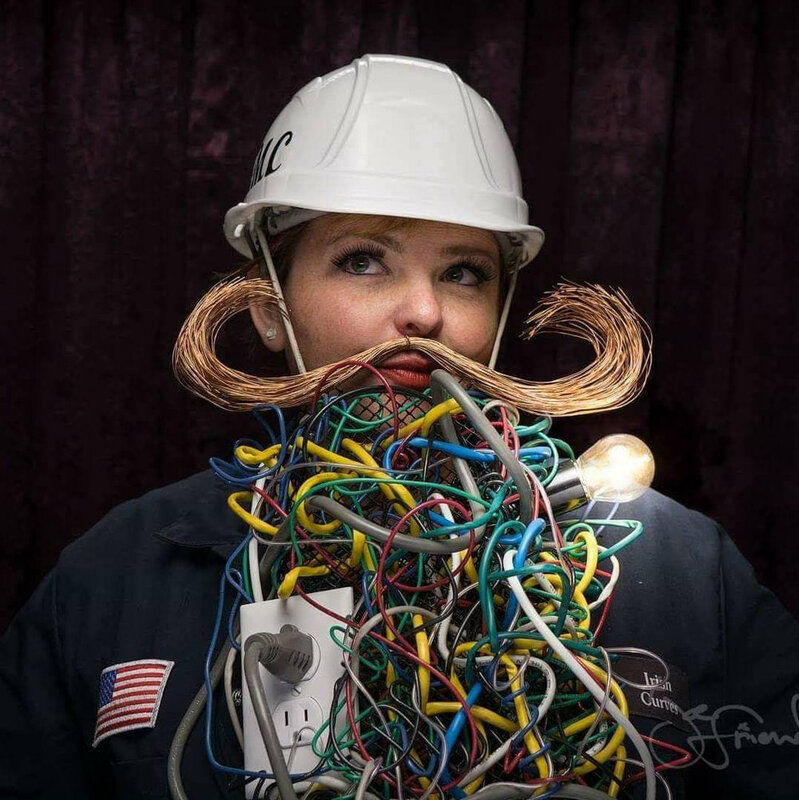 Funny story April 9, 2016 East Coast Beard and Mustache Championship 5 in Philadelphia. When I was registering (Full Beard Natural under 6”) I was beard shamed a bit by them saying I was in the “baby beard” category. It took me back for a second but then laughed it off. Later in the night I told a few people I would be shaving if I didn’t win. Look where it’s taken me now Ma! Have you won any awards? This is a topic I get bashful about when my friends tell strangers I have an “award winning beard” but I have a screen to hide behind so I’ll start from the beginning plus it would be a disservice to the people that put in a ton of hard work to hold these events, if I didn’t plug them. Good thing time is not an issue because this is a written article and I wasn’t given a word limit. Garden State Beard & ‘Stache Competition Five Year Anniversary -Did not place, I include this because this is where I realized it wasn’t about titles but the winning I did meeting new people. NOVA FHC Beard & Stache Competition ‘17 -1st Full Beard 6-12"
The Gentlemen’s Social Club of Los Angeles Beard Battle LA PT. 3 -2nd Full Beard Natural Over 8"
Why do you do it and/or Best thing about it? It...? Compete? Grow? Ok let me ramble a little more. I play to win the game! Oh and the huge cash prizes - wait, you don’t get any money?! I grow because I’ve always thought I was different than most and having a giant beard is a way of visually expressing that. The best thing is the perspective I’ve gained from learning about others struggles and triumphs. These people straight, gay, man, woman, addict, sober, survivor, veteran, refugee, artist, whatever label you put on them are amazing people. They are it! Have you won any awards? Yes, 1. Why do you do it and/or Best thing about it? It’s a lot of fun if I don’t have to shave. Hometown: Originally from Manati, Puerto Rico. Currently living in El Paso, Texas. Occupation: Forklift Mechanic and Trainer. Owner of Pulpo Beard Oils. Club/Product Affiliation: Co-Founder of the Bearded Villains West Texas Chapter. How long have you been bearding? Bearding since 2014, right after getting out of the Military. Have you won any awards? Finished 10th in the 15cm and under at Worlds in Austin; 1st in Groomed Beard at BAMM; 3rd in Full Beard Under 6" at the Whisker Bent in AZ; multiple top 5 finishes in LA, Sacramento, Arizona, Puerto Rico and New Mexico. Why do you do it and/or Best thing about it? I always wanted to grow a beard so once my Military time was up I was ready for the challenge. I had no idea of the whole competition or clubs or anything like that existed, but I am glad it does. The best part is meeting people from all backgrounds and learning from their experiences. Creating a bond thats pretty amazing. So happy to be a part of it.